We revisit a feature by the Columbia Journalism Review featuring prominent journalists on the best career advice they have received. For many, the right words of wisdom at the right time had a lifetime of impact on their careers. Here's what they had to say. 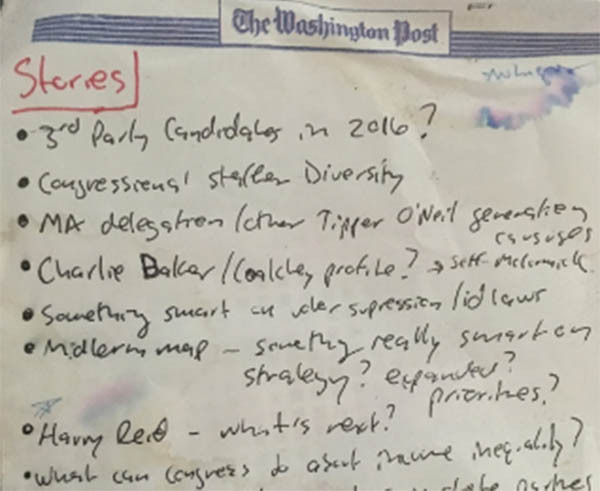 "One of the first editors I worked for after joining The Washington Post in 2014 was Terence Samuel, who at the time ran the paper’s congressional coverage (now he’s deputy managing editor at NPR). He told me that he wanted me, at all times, to be thinking of story ideas and writing them down. After every interview, what were two new leads? After every staff meeting, what tidbits were mentioned that would work as a stand-alone piece? When reading coverage by colleagues and competitors, what fact, statistic, or concept—often mentioned in the middle or end of the story—cries out for its own story, or series? What themes are surfacing in coverage by smaller, or more locally or regionally focused outlets that would benefit from coverage from a larger outlet with more time and resources? Wesley Lowery's list, courtesy Lowery. Laila Al-Arian, '06 M.S, senior producer and investigative journalist for Fault Lines, Al-Jazeera’s award-winning documentary show. He says that advice was given by Reginald A. Stuart, a journalism recruiter, mentor, and diversity advocate who has worked for McClatchy and Knight Ridder, and was formerly a reporter for The New York Times.